Most smokers are well aware of the dangers associated with the life-threatening addiction but quitting can nonetheless seem an overwhelming task. A device to help with that is Tosee, a smart cigarette holder which enables smokers to track their habit. It offers a data-driven approach similar to that of health trackers, which present information in a more manageable way. Tosee is a smart device which uses sensors to enable smokers to monitor their cigarette consumption, tracking the number of cigarettes smoked, the depth of inhalation and the amount of harmful substances — such as nicotine and tar — they inhale. The hope is that the data-driven device will provide a clearer picture of the negative impact smoking is having on their health and finances, instead of the impersonal statistics and facts they may have grown immune to. Users can set themselves custom targets and reminders, and connect to a community of other users to gain support and tips. 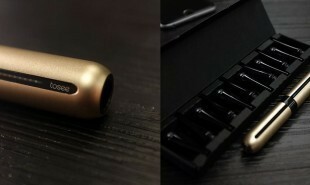 Tosee, which is made by Chinese startup Angmi, comes in gold or dark grey and costs 899 Chinese Yuan — approximately USD 145. Are there other bad habits that can be to cut down through integrated data-driven devices?